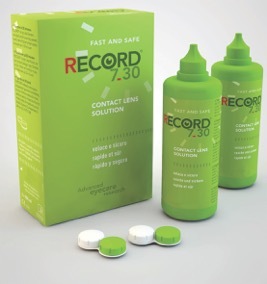 RECORD 7_30 is a new Optician Only multipurpose preserved solution that provides effective lens disinfection in a super-fast time. in a RECORD time of just 30 minutes. After a 'Rub, Rinse, Rub' regime, just 30 minutes of soaking in a lens case produces fresh, clean, comfortable lenses. Ideally suited to those who live an active lifestyle, RECORD's speedy effectiveness is based on a large molecule formula that reduces corneal staining.